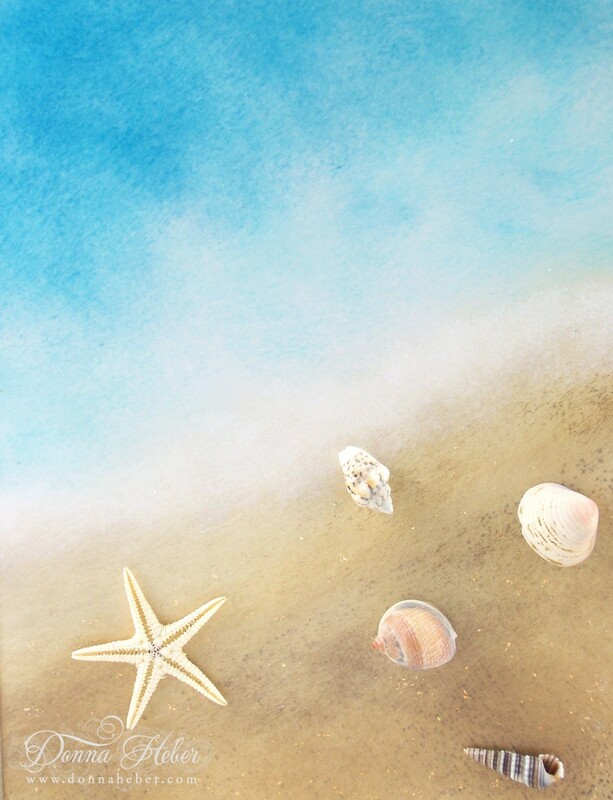 My card today has me dreaming of the beach and was inspired by the very talented Michelle Zindorf. On a piece of glossy white cardstock I sponged Crumb Cake, Soft Suede, Tempting Turquoise and Not Quite Navy. To create the sea foam I added ColorBox Frost White to the middle. For the illusion of sand, I stamped my unmounted Texture Wheel on the Crumb Cake corner first in Soft Suede then again with Early Espresso. I applied Diamond Stickles to the sand to create some sparkle then glued to the paper miniature sea shells. The inside sentiment was stamped in StazOn Black and then sponged with Crumb Cake, Soft Suede & Tempting Turquoise. I hope you get a chance to relax by the beach this summer! A close up of the sea shells. Beautiful shading on this Donna, love the inside. 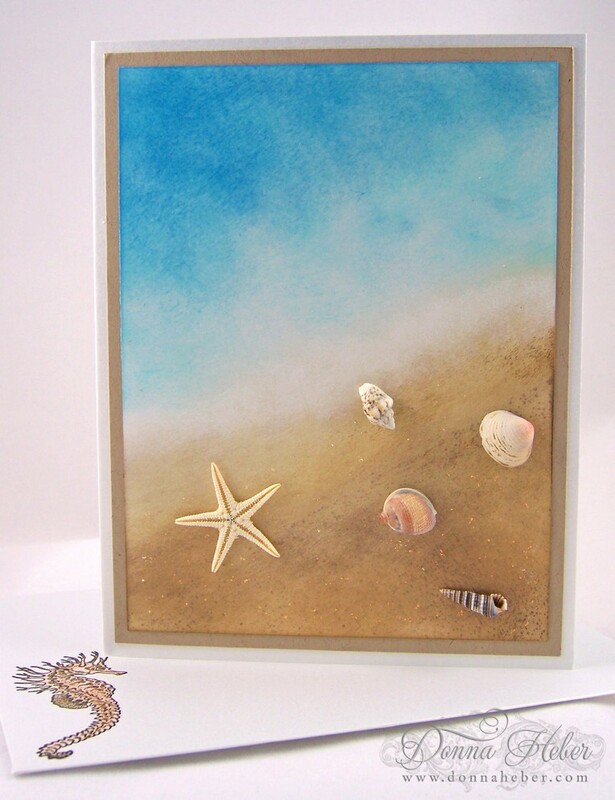 The sand is incredible - love the entire card - the seahorse - the shells, the subtle colours - the text. Thanks for sharing. 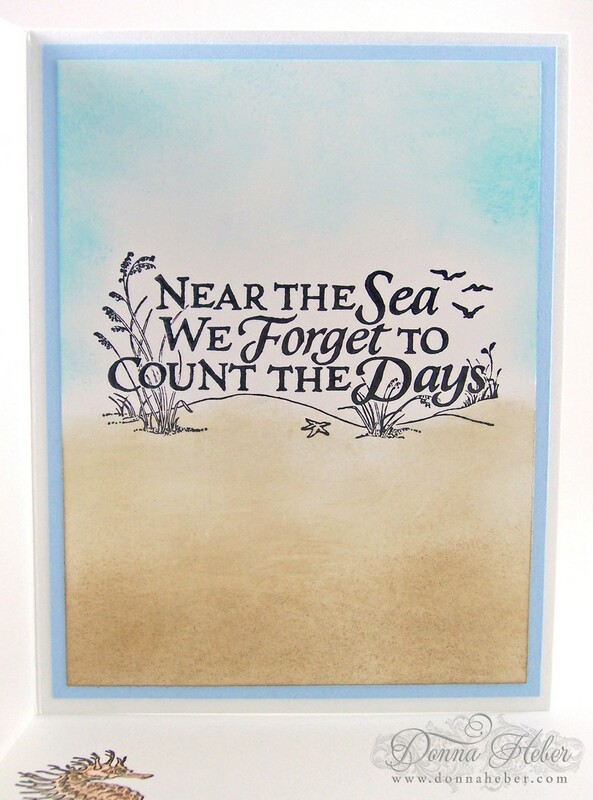 A beautiful card for those of us dreaming of being at the beach! Great job "making" your sand! This is gorgeous inside and out! what a wonderful sea card donna. great sponging and use of colors. I love, love anything to do with the beach! Your card is beautiful! I love how you created a fabulous beach scene! Pretty! You are very creative. Love the idea and the results. It's amazing what you have created with virtually just inks. Who knew ink could be such a powerful design tool with a sponge. This is gorgeous. A lovely card, Donna. I miss being near the ocean, but am near Grandkids! Not much time to stamp this summer, though. Awesome card. Love how you made the sand. I feel like I'm at the beach.